With the KT-2A Klark Teknik offers an interesting replica of the legendary and popular LA-2A compressor. Both the appearance and the operating concept with the two large potentiometers are reminiscent of its famous model, while the VU meter, limit/compressor switch and gain reduction are also on board. 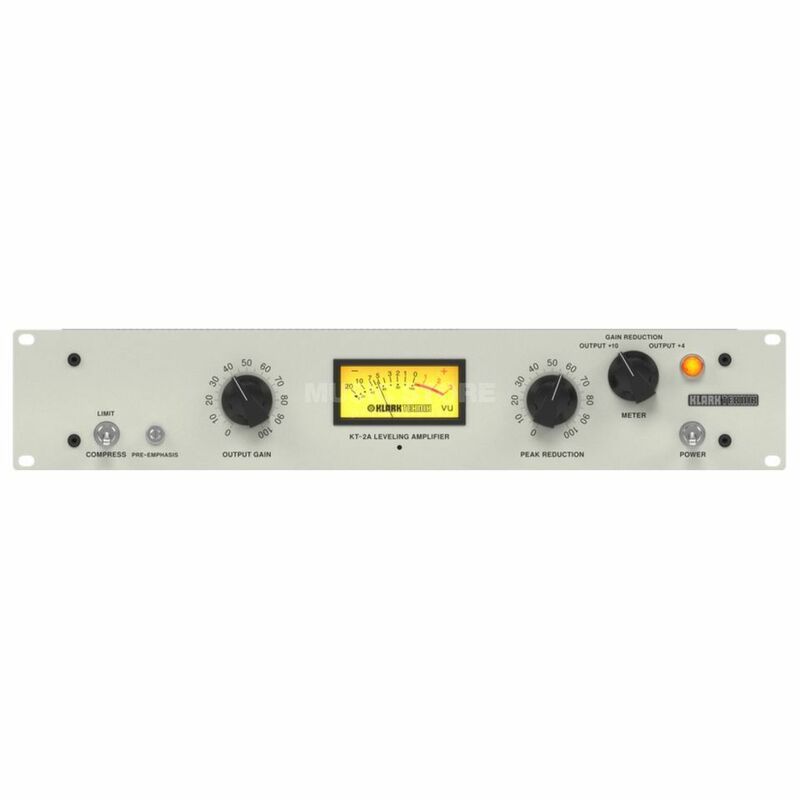 In addition, KT-2A 12AX7, 12BH7 and EL84 tubes are used, which provide special, warm and efficient compression over the entire frequency range from 10 Hz - 20 kHz. The signal path is completely discrete and the compressor/limiter is equipped with MIDAS input and output transformers. Klark Teknik also promises extremely short attack times of 10 ms, while the release time ranges between 50 ms and 5s. Like the original, the KT-2A is mono, but can be combined with another KT2A for stereo signals. The compressor is connected via the balanced XLR connectors on the rear or via a jack. A robust, durable metal housing with a height of 2U rounds off the special replica. I couldn't believe my ears when I tried it on vocals first time, it was with a big smile :) Then I tried some acoustic guitars same there, smooth and so nice sounding. Actually everything I put on it sounds much better after. Thank you Klark Teknik!!!! The Klark Teknik KT-2A is by far the best vocal compressor I have in my rack. The sound quality is superb and the compression is like butter on all the vocals I have run through this unit. The pre-emphasis knob is an excellent addition and allows me to adjust the tonal balance of the sound from dark to bright. The build quality is amazing and is better than some units costing 3 times as much. Mentioning the price, this is cheaper than some software compressors! I don't know how they managed to get the price so low, but please keep this up and bring on some more remakes of classic recording studio gear! Chi conosce l'LA2A si sentirà a casa, ottima qualità ad un prezzo quasi da regalo. Possiedo anche il KT-76 e accanto agli altri miei compressori non sfigurano affatto, anzi, per certe applicazioni sono diventati la prima scelta. Volendo trovare un difetto, 2 delle 4 valvole sono saldate direttamente sulla scheda per cui quando sarà necessaria la sostituzione si avrà la scomodità di dover dissaldare. Coming from vst compressors background, I am far more than just happier. KT 2A is just good on any thing I have tried so far be it vocals, acoustic guitar, cello etc etc. It gives me so much headroom which I was always longing for and trust me no vst compressor comes close to a reasonable outboard compressor. I am planning to buy another one to make both sit permanently on my 2-bus for mixing and mastering. Stereo linking on this unit will make things so easier. Get one guys until supply lasts.